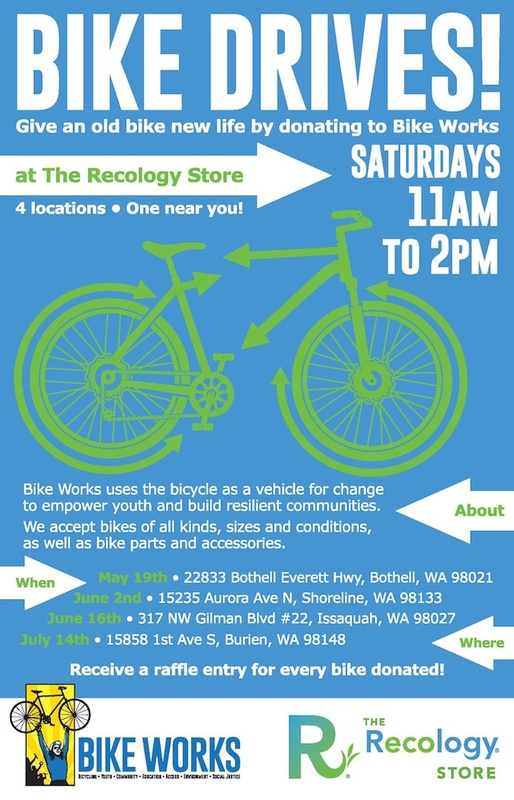 On Saturday June 2nd, the Shoreline Recology Store will host a bike drive benefitting Bike Works. They invite area residents to drop off their unwanted bicycles, bicycle parts and accessories. For each bike that you donate, you will receive a raffle ticket for a basket of goodies, including two stainless steel Hydro flask water bottles, a solar power bank, and a variety of other eco-friendly products, valued at $200. Where will your bicycle go? It could be refurbished by the Bike Works Recycle and Reuse Team to be sold in the Community Bike Shop in Columbia City at an affordable price. It could be part of Bike Works’ youth or adult bike repair classes, where students learn to overhaul bikes. Or it could be fixed up by one of our regular volunteers. Afterwards, Bike Works staff inspect each bike before giving it away to community members with limited resources. Watch this video to find out more about Bike Works bikes. Drop off your bike at the Recology Store Shoreline on Saturday, June 2, 2018 from 11am to 2pm, 15235 Aurora Ave N, Shoreline 98133.